During our time in Guangdong province we had the opportunity to take a day trip to Hong Kong. In Hong Kong we met with Duncan Jepson (director of “Follow your heart.” For more, take a look at Angela’s previous post) as well as Hong Kong rapper and artist, MC Yan. 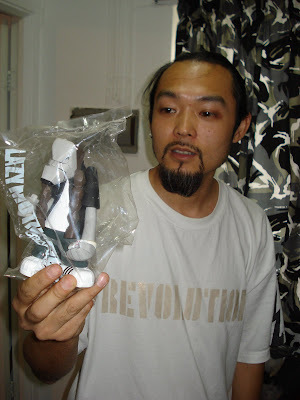 MC Yan is former member of Hong Kong’s Lazy Mutha Fucka, or LMF, a Hip Hop crew active throughout the mid 90s to the early 00’s, making them one of the first Chinese Hip Hop groups. Though LMF disbanded in 2003, it continues to be regarded as one of most influential Chinese Hip Hop groups. Their provocative lyrics and attitudes set them apart from mainstream Canto-pop music and grabbed the attention of Chinese youth both in Hong Kong as well as Mainland China. Take a look at LMF’s music video for their song “大懒堂，” the group’s name in Chinese. MC Yan, with fake handlebar moustache and real pigtail braids, does the main rap verses. So far, MC Yan is the only Hong Kong rapper that we have interviewed. With our project’s main focus being Mainland Chinese Hip Hop artists, trying to include Hong Kong’s Hip Hop scene, or similarly, the Taiwan Hip Hop scene, would in some ways take away from the unique themes and concerns that characterize each place. Though the “One Country, Two Systems” policy enacted in 1997 brought “Hong Kong home to China,” the vastly different social and political histories of the two places continue to make them feel like two completely different countries. Director Duncan Jepson explained his decision not to include Hong Kong in his film “Follow your heart” by pointing out that Hong Kong youth and Mainland Chinese youth face different issues in their exploration and development of Hip Hop culture. Access to Western music and culture came much earlier and much easier in Hong Kong than in Mainland China, having a major influence on how the respective Hip Hop scenes developed. Hong Kong’s Hip Hop scene came first, but at this point, Mainland Chinese Hip Hop is growing and developing at a much faster rate, similar to the Chinese economy. In our visit to his studio, MC Yan gave us his personal take on the differences between Hong Kong and Mainland China’s Hip Hop scenes, shared his thoughts on current world issues that interest him, and gave us a look at some of his current projects. Post-LMF, MC Yan has a lot going on. From developing memory sticks as a new platform for releasing music, to making it into the Guiness Book of World Records for the world’s farthest tag (using L.A.S.E.R. technology developed by GRL), to developing his label “宁死不屈,” or “rather die than dishonor,” MC Yan’s is putting his personal motto of “keep being creative all the time” into action. Our visit to MC Yan’s studio reminded me how lucky I am to have this opportunity to meet such interesting and thought-provoking artists. Check out our visit with MC Yan.